The MFA is hosting the first of four all-night raves "mfaNOW" contemporary-art events that includes dancing and "food trucks and lawn games, live music and DJs, lectures, artist demonstrations, performance art." Only problem is more people showed up than the museum expected/can handle ... Read more. Keiko reports the Museum of Fine Arts will hold a panel discussion next month on lessons learned from last year's "Kimono Wednesdays" controversy, in which Asian-American protesters charged letting white people try on a kimono was racist cultural appropriation - an accusation met by Japanese and Japanese-American counter-protesters, who saw the event as an introduction to Japanese culture. She posts a statement by the MFA on the lengthy negotiations that led to the Feb. 7 event - which is free but for which you have to reserve tickets. Some arty group in Brooklyn (yes, Brooklyn) has decided our recent MFA kimono contretemps is worthy of a panel discussion: Read more. Accuse MFA of "aesthetic terrorism" for continuing to display works by Renoir, so will picket at noon on Monday. Artblog.net covers the latest controversy around that kimono thing at the MFA: The people who organized the original "yellowface" protests organized a panel discussion for this Saturday at MassArt - from which they initially planned to exclude whites, and prevent blacks and Latinos from making any comments - although they would be given note cards on which to jot down questions. Read more. Support for Kimono Wednesdays at the MFA is just what it sounds like. The Globe reports on last evening's gallery talk about that Monet painting. The teacher was disappointed people can no longer wear a kimono matching the one in the painting; on the other side, there was some check-your-privileging going on. The Museum of Fine Arts reports it's responding to complaints about cultural appropriation and banning the weekly wearing of kimonos in front of Monet's La Japonaise. 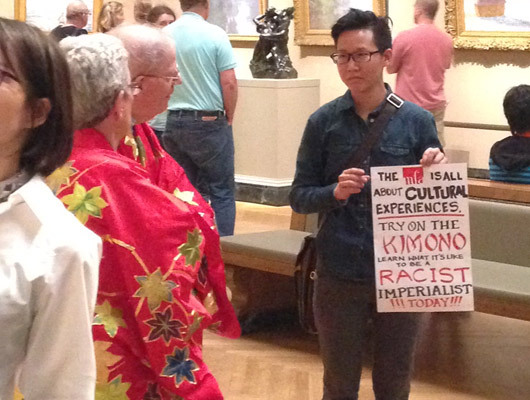 Last week, protesters stood with signs in front of the painting protesting non-Japanese people being allowed to put on a kimono as cultural racism. In a statement today, the museum says: Read more. A roving UHub photographer reports the MFA had this "try on a kimono" event this evening - that got crashed by a man and a woman who tried to convince participants they were being racists by trying on kimonos or even just looking at paintings of people in kimonos - by participating in "yellowface." He was not impressed: Read more. WBUR reports the appointment of Matthew Teitelbaum, currently director of the Art Gallery of Ontario, which his father, artist Mashel Teitelbaum, used to picket as being elitist - which brings us to an open letter to Teitelbaum by Greg Cook, who knows something about combating elitism at the MFA. 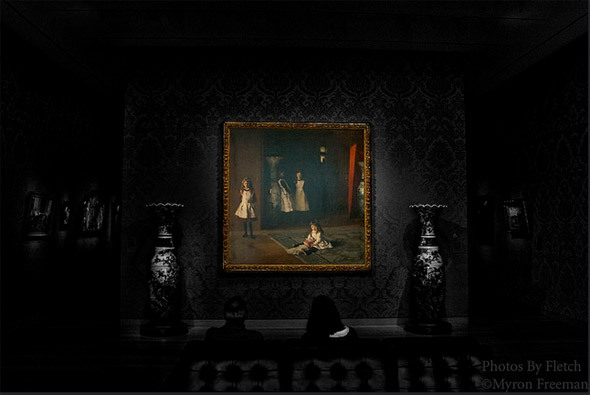 Myron Freeman took in a couple of people taking in Sargent's Daughters of Edward Darley Boit at the MFA recently. Copyright Myron Freeman. Posted in the Universal Hub pool on Flickr. Accessible and collaborative, generous of spirit, outgoing, and one who enjoys the social demands of the Director’s role; Integrity, fairness, decisiveness, and good and tempered judgment. Viewsnortheast photographed some sidewalk drawings of the giant baby heads outside the MFA the other day. They just went on and on. Copyright Viewsnortheast. Posted in the Universal Hub pool on Flickr. Boston Magazine reports somebody went around the outside of the MFA spray painting bad renditions of Homer Simpson - including on the base of "Appeal to the Great Spirit" on Huntington Avenue. Ed. question: Anybody notice the explosion of graffiti along the Orange Line from Forest Hills to just past Back Bay over the last few months? Roving UHub photographer Steve Chase photographed one of the giant baby heads at the MFA around noon yesterday, reports that by 2 p.m., the hat was already gone. 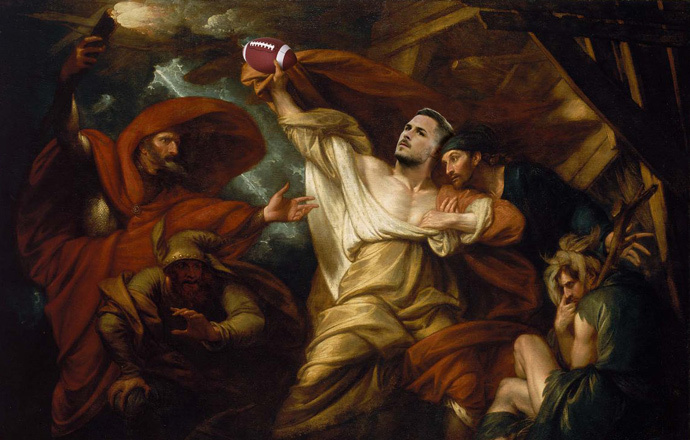 He wonders: Who made it and who took it?